Here's a simple card using the Greenhouse Garden DSP and the coordinating Friends Never Fade stamp set. 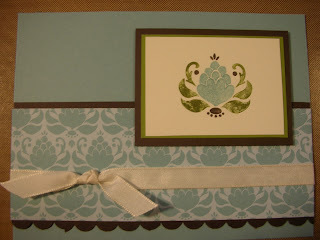 I colored the stamp with markers and layered with Old Olive and Early Espresso on a Baja Breeze card. I just love the new Seam Binding ribbon in the current Occasions Mini Catalog and the Holiday Mini Catalog. Have you tried it out yet? If not, plan on ordering some with your Sale-A-Bration order!